Since late last year, I have been travelling overseas, and as a result, have not add access to my beloved gaming PC (and as such have been on a hiatus from writing). Truly tragic circumstances. Without access to quality platforms, and due to being incredibly busy, I’ve found myself completely deprived of gaming. Yet, the other day, I was scrolling through my Steam library and came across The Banner Saga. A going away gift from a friend back in November, I had completely forgot it was there. On a day of gloomy weather and uninspired thoughts, I fired it up and decided to see if it would run on my shoddy, less-than-two-hour-battery-life laptop. I discovered two things. That, yes, it can run on my horrendous laptop (and I’m anything else), and that The Banner Saga is a compelling and understated masterpiece, built on a gorgeous art style and rich, emotive soundtrack. Which genre? Does it matter? The Banner Saga presents itself as an interesting fusion of genre and gameplay styles. Released back in 2014, it’s fifty percent strategy game, fifty percent indie-art game, fifty percent visual novel. I’ve also seen it described as a SRPG (strategy role-playing game). Refreshing and unique, you might decide to describe it in a completely different manner, and that’s okay. Much of its resonance is grounded in that it’s not a copy and paste of another style. Its lack of a single genre and style means its attractive for a wide range of audiences. If you need any evidence of this, just look at the amount of platforms The Banner Saga has been ported to since its initial release. You can find it on Windows, OSX, PS4, Xbox One, iOS, Android and Nintendo Switch. Wide appeal indeed. While you may not need to master strategy to finish The Banner Saga, one thing you should definitely have reserved when playing is time and patience. In no ways does this game rush. It’s been a while since a title has consciously made me want to slow down and savour every moment. So much of this is driven through The Banner Saga’s art and sound design. The game’s distinct aesthetic style, intrinsically linked with the gameplay, makes transitions between long narrative-focused sections and strategic combat feel smooth and natural, fostering strong immersion. Likewise, the beautifully scored soundtrack and satisfying sound effects further add to the atmosphere of The Banner Saga, dragging you deeper inside the landscape of its world. Soundtracks are perhaps the most powerful tool in playing the heart strings of gamers worldwide. A game might be written ingeniously, with incredible gameplay and wonderful characters, but if it lacks a quality soundtrack, it can really impact the experience. This is not the case with The Banner Saga. Often, I admit, I’ll take soundtracks in games for granted (we probably all do). This is because we’re in an age that’s arguably being dominated by multiplayer-only or multiplayer-focused games, where an intricately scored soundtrack just isn’t necessary for a quality experience. When it comes to sound in multiplayer games, diegetic sound (organic within the game world) is what is important, required for interaction and decision making within games. For instance, in Rainbow Six: Siege, you need to be able to hear the diegetic sound effects of an enemy’s footsteps, so you know what direction to peek in order to take them out. 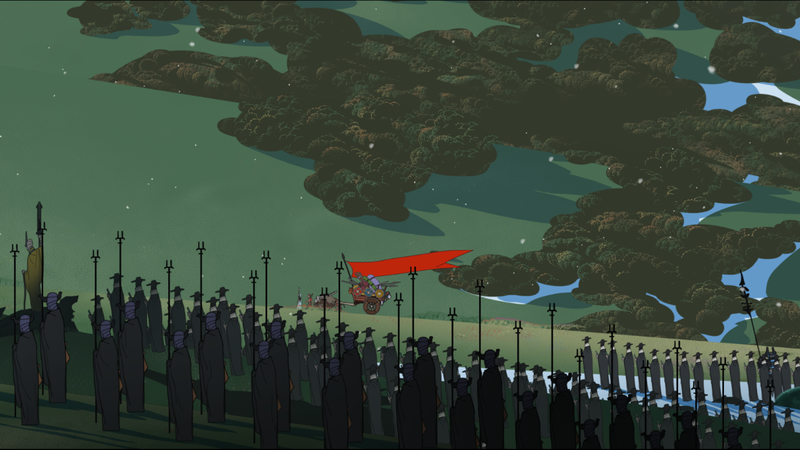 In The Banner Saga, diegetic sound effects aren’t needed for split-second decision making. As the combat is turn-based, this kind of feedback system isn’t at the core of success or failure within the game. Going back to the soundtrack itself, because so much of The Banner Saga is minimalist and softly spoken, the soundtrack is what drives it emotionally. Proper cut scenes only really occur at the very beginning, so there’s no audible dialogue from characters, instead substituted for text on the screen with various animations. This means that often the soundtrack needs to make up for the tone and emotion of the dialogue at that moment. Equal parts somber and epic, the soundtrack of The Banner Saga captures so many different moods and snapshots of potent emotion throughout the duration of the game. 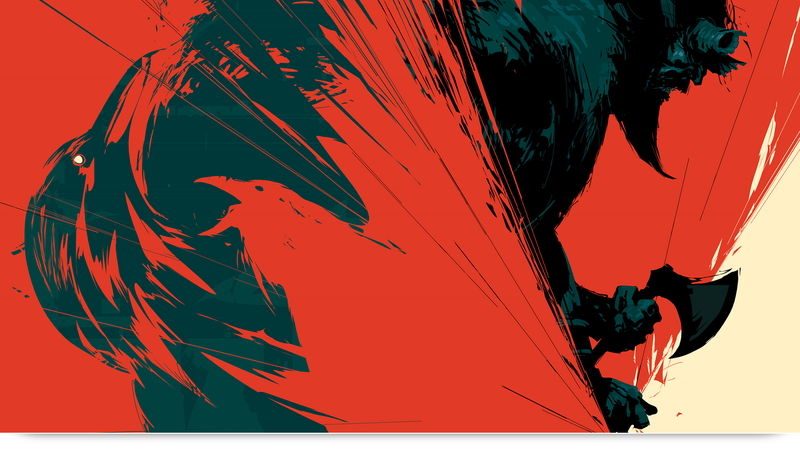 Again, this makes up for the lack of traditional flesh and bones that The Banner Saga possesses. Ultimately, if you dissect it closely, the game is not that sophisticated in combat, or complex in its narrative. So its soundtrack acts as the entire backbone. There were moments throughout finishing the game when I felt compelled to get up from my desk and march around heroically, trumpets blaring as I had just dispatched my last foe on the screen before me. The timing of these emotional beats in the soundtrack are superb, and reeled me in again and again. Upon researching the composer for The Banner Saga, I was not surprised it was Austin Wintory, who has also composed the soundtracks for other understated and beautiful indie titles like Flow and Journey. I am by no means an art buff, or even have anything close to a vocabulary of art-related terms to draw on. Yet, I will try my best to distill exactly what is incredible about the art of The Banner Saga into words, and how it’s linked so wonderfully with the sound design to generate immersion. 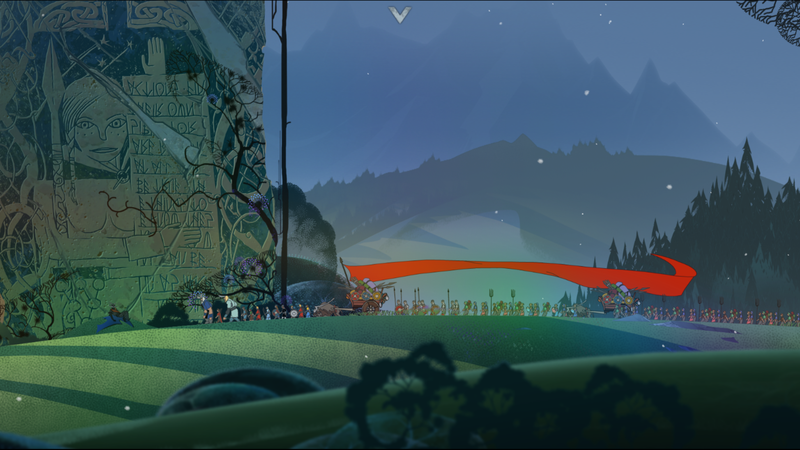 Part of its minimalist and understated design is exactly why The Banner Saga feels like a visual novel. Long periods of time can progress without any direct gameplay, dialogue or information being transmitted. Often the game is reduced to a wide angle shot of your group of clansmen and varl trekking across the icy landscape, aided by a foreboding backing track. It’s in all honesty quite simplistic, but it works, and that’s what matters. 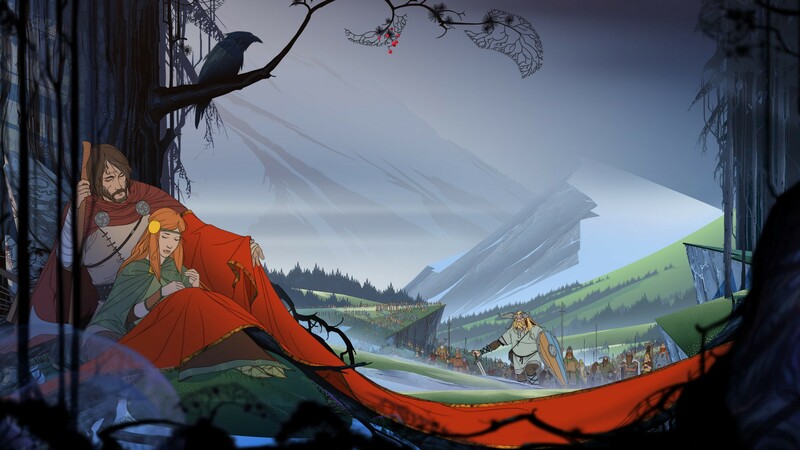 The specific use of a hand-drawn art style utilised in The Banner Saga (and its two sequels) generates a cinematic atmosphere, going hand in hand with the rich soundtrack. At times I forgot I was even playing a game, instead lent back in my seat watching the slow progress of the caravan across the barren landscape. Ideally every game wants its players to be immersed, but the power of The Banner Saga is in that it privileges immersion over interaction, a risky move to make considering the rise of hyper-interactive and demanding games over the preceding decades. 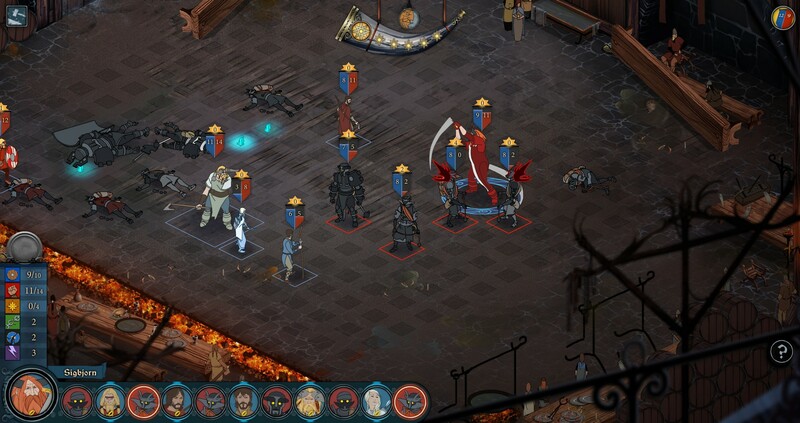 The distinctive isometric perspective turn-based combat dispenses with the side-on style used in the other moments of the game. It somehow still manages to maintain a sense of minimalism and artistic beauty in the process, without forfeiting any feeling of interactivity, or quality combat. The Banner Saga can be described in so many different ways. For me however, these kind of words come to mind: immersion, beauty, minimalist, unique, striking, powerful. Its a smorgasbord of indie delight, with a wonderfully ornate orchestral soundtrack and gorgeous artistic style, both in a semi 2D cinematic style and top down isometric style for combat. A potent balance of these two forces of music and art is struck, tied together with a strong enough plot and narrative that you won’t lose interest. 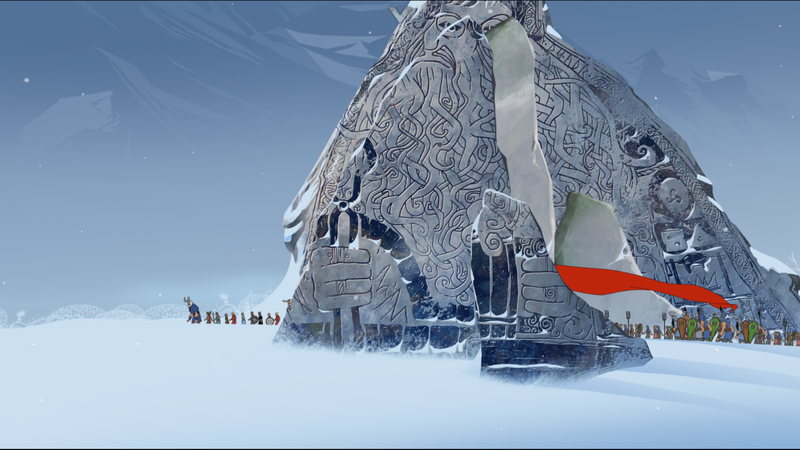 The Banner Saga wields the instruments of immersion unlike anything I’ve played in a long while. I write and play games, hopefully for a living some day.